Hello Radio fans! I am looking for some good advice on the 12-s-232 Zenith radio I have. Anyway, someone asked me about the Speaker in it, so I took a picture and sent it to them. They mentioned that it isn't the original speaker, but after reading the other posts on this forum about this radio, I think it may be the original. The speaker has a stamp on it that says "49-183 AB" then under that what appears to be 570 or 670 OHMS. (hard to read.) Can someone help me know what I have. Also, I have been told that the Chassis is in pretty rough condition, it has bad/wires and probably had a mouse living in it at some point. 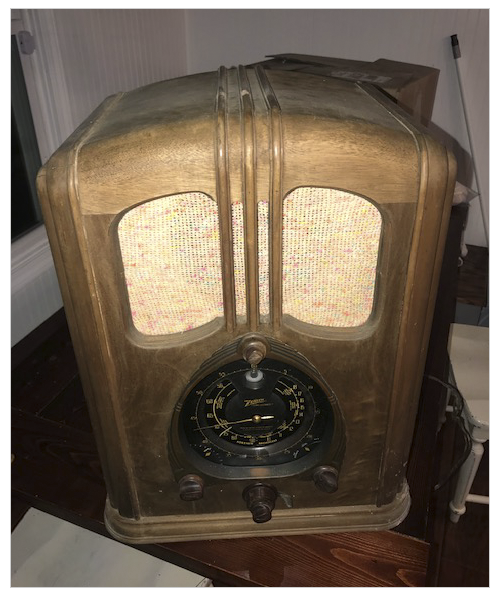 I am considering having the radio refinished by a guy that has been doing it for 30 years, but then I am finding on here that touching the finish may be a bad idea as far as value goes. Can anyone offer advice? Thanks! You can post photos as attachments straight out of the chute. No need to wait 24Hrs. Here are pictures. I was trying to load and they were too large before. Thanks for the tip, Greg. File comment: Here is the picture of the backside of the speaker. Ditto what Greg said. Take the chassis out of the cabinet. Take pictures of the top and bottom. Post them along with pictures of the cabinet and the speaker. Then you will get proper good advice. Also check the bottom of the cabinet and see if there is a number on a stapled piece of paper on the bottom of the cabinet that number will or won't match the metal tag number on the back apron of the chassis. Last edited by wes3180 on Jan Tue 08, 2019 9:46 pm, edited 1 time in total. That is the 7 tube version of the Walton. Same cabinet just a lessor 7 tube chassis. My wife and I did that restoration about 15 years ago. Notice the very large mouse nest inside the chassis. I rotated one of your photos! Wow! You did a great job restoring that one. Glad to hear they have it back! Well, it is rough, but certainly restorable. Since you are looking to sell it, just sell it as-is. I don't think having it refinished is worthwhile for you as a seller. It is a valuable set when in good condition, but getting there is going to be a labor of love. Best thing to do is to sell it to a hobbyist who has the time and dedication to restore it. What kind of price or where would you find such hobbyist? Also, someone mentioned to me that I should not buy a 12-s-232 restored chassis if one came available because the numbers might not match. I don't really know what they were saying, but I was thinking of trying to watch when one would come available and then have the case restored and then put back together. I'd much rather, though, just sell it to someone who wants to love on it and restore it for themself and make it really nice. Yes the Junior Stratosphere had a "Litter of Walton radios"
The speaker in the 12 tube walton is a good share of what the radio is worth. Same reason I asked if the number on the bottom of the cabinet matched the number of the serial number tag on the backside of the chassis. As John Goller has pointed out, you have the original 49-183speaker, and it is the most valuable component of the radio. The 49-183 has been known to sell for $1000+ on eBay, assuming that it is in working condition. You'd find no shortage of collectors who would be willing to restore a 12S232 Walton, as it's one of the most desirable tombstone radios out there. A restorer could probably replace a lot of the rusted out components on the chassis with parts from a donor chassis, but they'd want to keep the original chassis with the "12S232" stamp that indicates that it came from the Walton tombstone and not from one of the other 1938 Zenith radios that used the identical chassis. It wouldn't surprise me if that radio would sell north of $1800 on eBay. In good condition they usually sell for somewhere in the high $2000's to low-mid $3000's on eBay. $1800 for a cabinet that needs a refinish and a rust bucket that is a complete strip. Wow! and several more Wows! seems ridiculous to me. Does it really matter if the field coil is open? Usually easy to rewind and looking at the chassis the speaker will have to be refurbed anyway. Must be rust inside and worse on the pole piece. Would send it off to a specialist and get it done including a re-cone or does that reduce its value? Your radio has a lot of potential. As said before it is worth some bucks as it is now. The cabinet is desired, and so is the speaker and the knobs, and I would agree that if you are going to sell it you can sell it as is and let someone else restore it. If it were mine I would probably replace that chassis with a chassis from another 12-tube Zenith, repair/rewind the speaker (if needed), and send the cabinet to Fred Taylor for a restoration. Of course the chassis could be stripped down, sanded, painted and restored unless there was significant mouse pee damage involving things like the band switch, IF transformers, motor drive, etc. So unless you are going to keep it consider selling it as is to a collector willing to restore it, understanding that the chassis might not be worth restoring, but that would be the buyer's decision and choice. Or you could part it out selling the cabinet, then the speaker, then the knobs. What ever the route you take this set should and will live on. The cabinet is one of the best. I have a 7-tube model and it is one of my favorites. Good luck and let us know if we can help you. Thank you for your comment. I don't know Fred Taylor, but does he have contact email I could check with them about it? Also, who would you suggest for Chassis restoration? I'm a bit interested in maybe selling it as parts like you mentioned, but I don't want to do anything yet, since I know a lot about these radios is to have the matching numbers on the chassis and all that, so don't want to start taking it apart until I think I'm ready. Post it on Ebay as is, for parts or restoration. Run it for 7 days, starting bid at $250.00. The final bid will be the indicator what its worth. 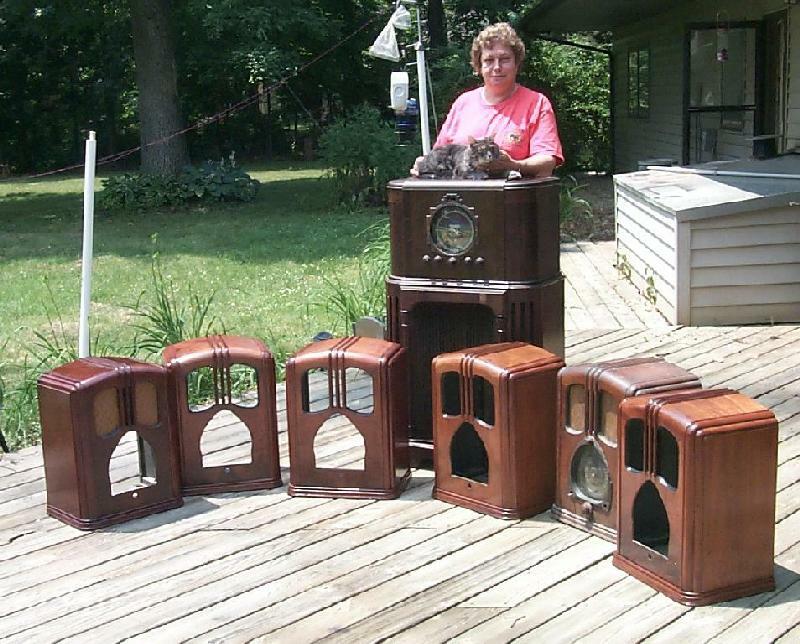 The cost of a total restoration would be pricy and probably beyond the radios worth. Getting the radio for free helps the profit end of things even though radio is in poor condition. No doubt someone will do the math for you! You can look under cabinet restoration on this forum and see Fred and send him a note like this or I will PM you his address. I do not think a matching serial number is going to make any difference on this radio. The model number is the main number on the chassis and the cabinet. Zenith used a probably rubber stamp with ink to put the model number on the chassis and cabinet (12S232) and has a metal plate with a serial number on it riveted to the chassis, and there is a small, often missed, paper tag on the back of that. So the only number on the chassis of importance is the ink stamp which will come off if you re-paint the chassis. And the same number in stamped on the cabinet. I may be wrong, but I think few buyers are going to be too concerned about the ink stamp number matching on chassis and cabinet. And if you restore that chassis and it has to be stripped, sanded and painted it is going to be an expensive chassis restoration. I probably won't keep the radio in the end. I will probably either sell it or fix it and sell it, but with 5 kids at home they like to break things, so I probably wouldn't do well to have it where the kids can draw on it with a Sharpie!